Microsoft is releasing Windows 10 Anniversary update on August 2. New keyboard shortcut keys also coming with the Windows 10 Anniversary Update. Check the list below. 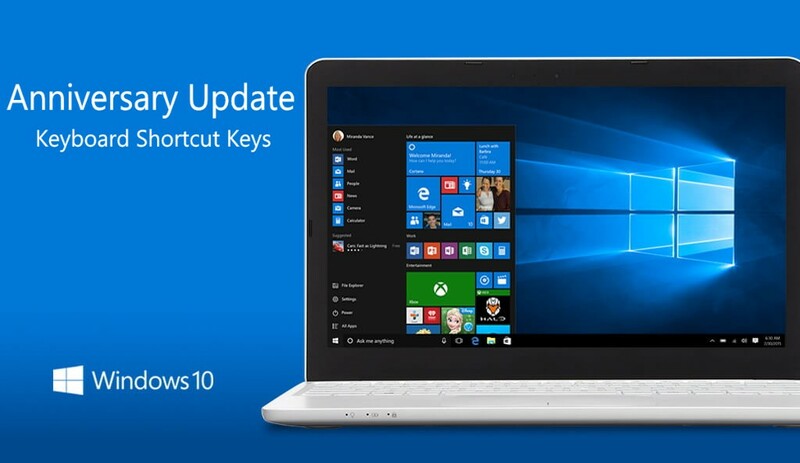 Shortcut Keys in the Windows 10 Anniversary Update. Alt + PrtScrn: Takes a screenshot of the open window and copies to your clipboard. WIN + PrtScrn: Takes a screenshot of your entire desktop and saves it to a Screenshots folder under Photos in your user profile. Shift + Right-click in File Explorer: Will give you the option to launch Command Prompt with whatever folder you are in as the starting path. WIN + Shift + Ctrl + <number> : Opens a new window of whatever icon (app) is in that position on the taskbar with administrative rights. For more Keyboard Shortcuts keys check out Microsoft’s official site here.